These collectibles provide a small insight into the many items found on the bourse each month. The monthly show focuses on coins, but other collectibles such as currency, bullion, exonumia, scripophily and non-money items can be found among the dealers' displays as well. Heads up, there is just one more show before the holidays and the end of the year. Join us to buy, sell or just browse among the showcases at the next coin show. Mark your calendars and visit the next Greater Atlanta Coin Show on Sunday, December 9, 2018, in the Joe Mack Wilson ballroom to meet the dealers and see the collectibles on display. The November 2018 Greater Atlanta Coin Show welcomed many guests to the three-room bourse down one level from our regular location. The dealers filled each of the rooms with their displays of coins, currency, bullion and other collectibles. Thank you one and all - the many visitors, the dealers, the security and the hotel's staff for making the November show a busy and interesting place to spend a few hours on a fall Sunday. This month, many of our regular dealers set up at the show, however we also had visiting dealers, some new to the show, substituting for dealers who had schedule conflicts. Thank you for joining us; we hope you enjoyed the show. Outside, the weather offered cool morning temperatures in the 30s increasing to the 50s in the afternoon. The skies began clear in the morning and became overcast by the late afternoon. This month's show coincided with Veteran's Day. We thank all who have served to protect our country and our freedoms through the years. Nearby, the city of Marietta held a parade to honor our veterans. As for "our" normal space, the hotel coordinated a beauty show throughout the weekend. Visitors to the coin show probably saw several of the participants throughout the day. The hotel generally hosts a church group each Sunday. For our November show, the church was nearby our bourse area. Whether it was us, the beauty show, the church, some other function, or all of the above, the hotel's parking lot remained busy during the day. If you joined us, thank you-we're glad you came. If you did not get to visit, take a look at just a few of the objects on the November bourse. 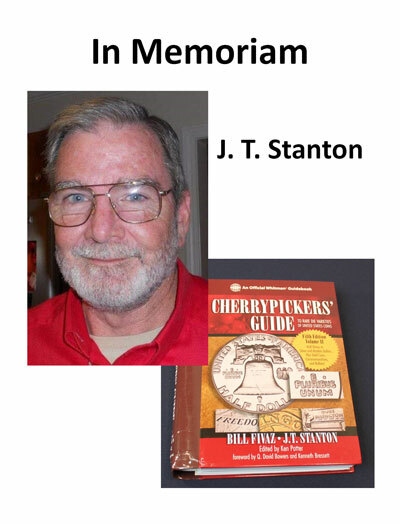 Sadly, this month we paid tribute and honored a distinguished member of the numismatic community, Mr. J. T. Stanton. Many of you will recognize his name from his work with variety coins and his contributions to The Cherrypickers' Guide to Rare Die Varieties of United States Coins. "J. T. Stanton has collected coins since 1959 and began specializing in errors and varieties in 1982. Well known as a teacher and lecturer in the die-variety field, he instructed American Numismatic Association Summer Seminar courses for 11 years and started the ANA's annual 'Errors and Varieties and Modern Minting Process' class. This item is not numismatic but is interesting nonetheless. Remember, our dealers have interests besides numismatics, this is one of them. Petrified wood, also called fossilized wood, is no longer wood. "Petrified wood is a fossil. It forms when plant material is buried by sediment and protected from decay due to oxygen and organisms. Then, groundwater rich in dissolved solids flows through the sediment, replacing the original plant material with silica, calcite, pyrite, or another inorganic material such as opal. The result is a fossil of the original woody material that often exhibits preserved details of the bark, wood, and cellular structures. "Collecting petrified wood can only be done on private property where permission has been obtained from the landowner, or on limited tracts of government lands where small quantities are allowed to be collected for personal use. "Some petrified logs contain a spectacular surprise! Cavities within them served as crystallization locations for quartz crystals such as citrine and amethyst." Perhaps not rare in nature, the limited ability to collect the pieces makes the petrified wood an interesting item to display. 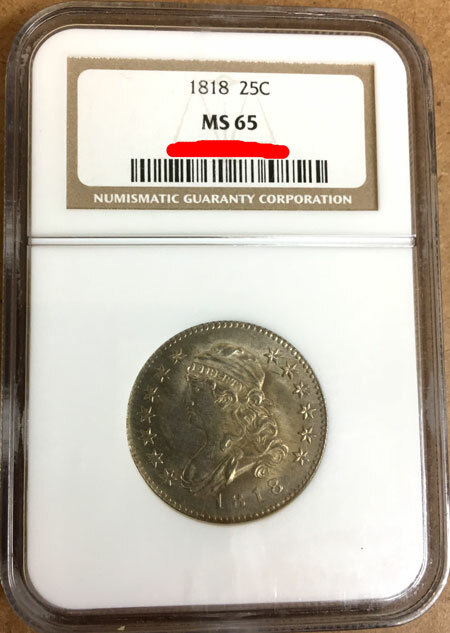 NGC (Numismatic Guaranty Corporation) graded this 200 year-old coin, a capped bust quarter dollar, as a MS-65. "No trace of wear, nearly as perfect as MS-67 except for some small blemishes. Has nearly full mint luster but may be unevenly toned or lightly finger-marked. 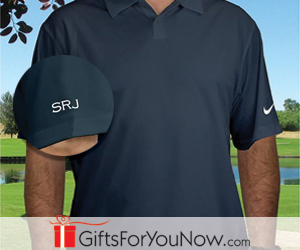 A few minor nicks or marks may be present." "Some weakness is evident at the centers, but most of the design details are sharply executed. Lovely mint frosty shines through the vivid gold toning over the obverse and reverse surfaces. Census: 25 in 65, 13 finer." After stopping production of the quarter dollar coin in 1807, the US Mint began production in 1815 of the Capped Bust quarter. Three years later they struck just over 361,000 of the coins. 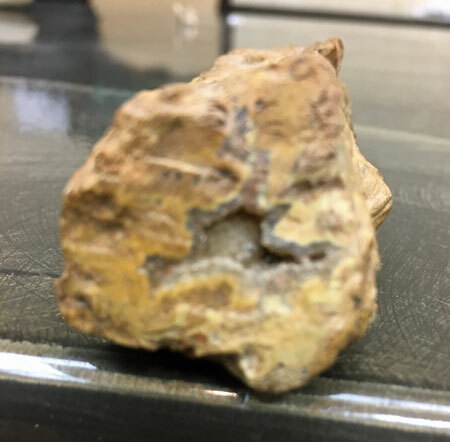 To date, NGC has graded 559 pieces with a low grade of PrAg, an average grade of 50 and a high grade of 67. This specimen provides a proud display of the 200-year-old coin. The next coin comes from the Modern Commemoratives, the 2017 Boys Town Gold Five-Dollar Coin. "A young parish priest named Father Edward Flanagan had a theory: Every child could be a productive citizen if given love, a home, an education and a trade. "Armed with his belief, and $90 he had borrowed, he rented a boarding house where boys of all races and religions were welcomed. "Father Flanagan’s Home for Boys, or 'Boys Town' as it became known, has grown exponentially since its founding in 1917. "The Boys Town Centennial Commemorative Coin Program Act (Public Law 114-30) was signed into law on July 6, 2015, to commemorate the 100th anniversary of Boys Town. "Under that law, Congress directed the Mint to strike and issue up to 50,000 $5 gold coins, 350,000 silver dollar coins and 300,000 clad half dollar coins. 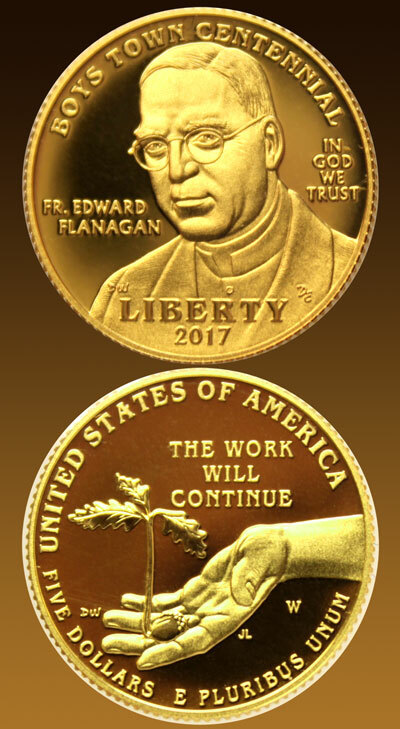 "Prices for the coins include surcharges of $35 for each gold coin, $10 for each silver coin and $5 for each half dollar clad coin, which the law authorizes to be paid to Boys Town to carry out its cause of caring for and assisting children and families in underserved communities across America." The most recent US Mint production report (November 25, 2018) shows a population of 1822 Boys Town Gold Proof and 2947 of the Uncirculated Gold coins. In numismatic parlance, low production numbers can lead to higher value. Time and collectors' interest will decide. "The ANA has recognized J.T. 's contributions to the hobby with awards including the Medal of Merit, the Glenn Smedley Memorial Award, the Outstanding Adult Supervisor Award, and two Presidential Awards. "J.T. has taken leadership positions in the hobby community over the years. He served on the board of governors of the ANA from 1995 to 1997. His dedication to CONECA (Combined Organizations of Numismatic Error Collectors) includes terms on the board of directors and as the group's president. He was elected to CONECA's Hall of Fame." Rest in peace Mr. Stanton. You will be missed by many individuals and by the coin collecting community as a whole. 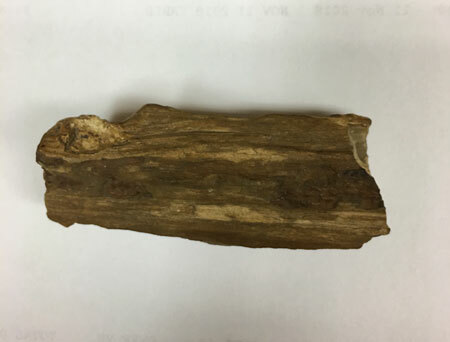 "Some specimens of petrified wood are such accurate preservations that people do not realize they are fossils until they pick them up and are shocked by their weight. These specimens with near-perfect preservation are unusual; however, specimens that exhibit clearly recognizable bark and woody structures are very common. "Petrified wood is not rare. It is found in volcanic deposits and sedimentary rocks at many of locations worldwide. It is sometimes found where volcanic activity covered plant material with ash, mudflows or pyroclastic debris. It is found where wood in sedimentary deposits was replaced by minerals precipitated from groundwater. It is especially abundant around coal seams, although many of the wood specimens in these locations are casts and molds rather than petrifications. 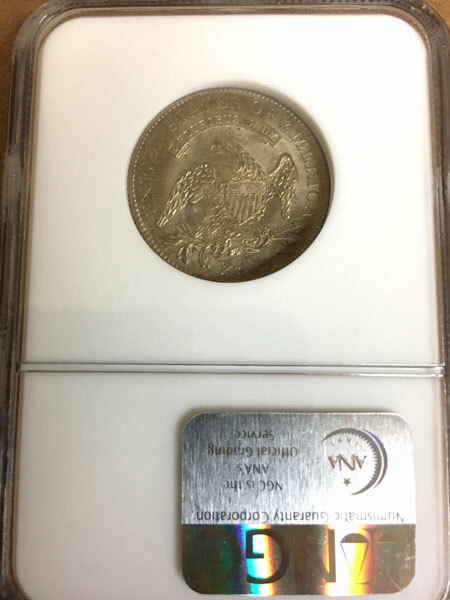 "1818 25C MS65 NGC. B-3, R.3. This die combination includes a later use of the overdate obverse die, although in this stage the overdate feature is no longer visible. "The overall B-3 die combination, while scarce, is usually available in higher grades, and this Gem MS65 piece barely reaches the low end of the Condition Census. "Today it is one of the largest non-profit organizations in the country, dedicated to serving at-risk children and families of all backgrounds and religions. "Through its Boys Town National Hotline, Boys Town National Research Hospital, and other community services, the organization provides treatment for the behavioral, emotional, and physical problems of children and families in 11 regions across the country. "Boys Town programs impact the lives of more than two million children and families each year. "December 12, 2017, will mark the 100th anniversary of Boys Town, Nebraska.